The EU’s Third Driving License Directive (3DLD) took effect from the 19th of January 2013. The directive introduces significant changes to the way in which motorcycle riders are licensed in the European Union. It is the introduction of the A2 category which causes the most confusion for riders, because it has very specific requirements. For example, a motorcycle cannot have a power output of more than 35 kW, nor can it be derived from a motorcycle with a power output of more than double that. This last stipulation means that some full power bikes can be restricted to A2, and some cannot. This video produced by the RSA gives a good overview of the license categories. To give you, the rider, a better idea of what this all means, MAG Ireland has put together a list of popular motorcycles to show which ones fall into which categories. 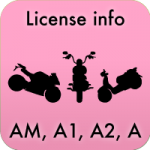 We also highlight those full power motorcycles which can be restricted to meet the A2 license requirements. Initial bhp and weight measures are courtesy of the Blue Pages from Bike Buyers Guide. We in MAG Ireland extend our thanks to the publishers for granting us permission to use their data. We expect this list to grow as and when more information becomes available. For example, it is expected that the major bike manufacturers will introduce factory restricted versions of popular middleweight models where these are currently outside the constraints of the new A2 license. MAG Ireland provides this information in good faith, errors and omissions excepted. It is intended as a guide only. This is not a legal document. You alone are responsible for ensuring that you comply with the law. If in doubt, seek qualified advice. Your insurance may be invalid if you breach the terms of your license. Where the insurance company pays out on a claim, it may seek to recover the costs from you if you are found to be in breach of your license. Remember, you cannot legally carry a pillion passenger on a learner permit. That said, MAG Ireland aims to actively maintain and update this list. We will be making contact with manufacturers to verify figures wherever possible. Also, we have added a form at the bottom for you to send corrections to us if you spot something amiss. If you copy or use this list on your own web site, forum, blog, etc. we ask only that you credit MAG Ireland and include a link to this page. AM Two-wheeled mechanically propelled vehicle, not capable of being manually propelled. The machine must have a cylinder capacity not exceeding 50 cm3, in the case of an internal combustion engine, or a maximum continuous rated power of no more than 4 kilowatts in the case of an electric motor. The vehicle must have a design speed of at least 25 km/h but not more than 45 km/h. A1 A Category A1 motorcycle without sidecar, with a cylinder capacity of at least 120 cm3 and not exceeding 125 cm3, and capable of a speed of at least 90 km/h, with a power not exceeding 11kW and with a power/weight ratio not exceeding 0.1kW/kg. If the motorcycle is powered by an electric motor, the power to weight ratio of the vehicle shall be at least 0.08 kW/kg. A2 A Category A2 motorcycle without sidecar, with a cylinder capacity of at least 395cm3, and an engine power of at least 20 kW, but not exceeding 35 kW and with a power/weight ratio not exceeding 0.2kW/kg and not derived from a vehicle of more than double its power. If the motorcycle is powered by an electric motor, the power to weight ratio of the vehicle shall be at least 0.15 kW/kg. A A Category A motorcycle without sidecar, with a cylinder capacity of at least 595 cm3, and an engine power of at least 50kW and unladen weight greater than 175kg. If the motorcycle is powered by an electric motor, the power to weight ratio of the vehicle shall be at least 0.25 kW/kg. Example 1 – You can ride a Honda CBR250 on an A2 license, but you cannot sit your A2 test on it because it is less than 395 cc. Example 2 – You can ride a Suzuki GS500 on an A license, but you cannot sit your A test on it because it is under 595 cc. Update, 4th December 2013: – The RSA has published a list of “representative vehicles” (see here) which contains many omissions and errors. MAG Ireland is in the process of following this up with the RSA at present. This notice may change as new information comes in. With that lot out of the way, let’s take a look at the list. Pale yellow background indicates figures supplied by manufacturer. With thanks to Suzuki UK, Joe Duffy Motorrad and Waterford Harley Davidson. My bike is not on this list, and the new regulations mean I will be on an A2. My bike has to be no more than 35kW and not over 0.2 kW/kg! How do I know if my bike is A2 suitable? First, It cannot be derived from a bike putting out more than 70kW, so you cannot restrict something like an R1. Assuming you have a bike which left the factory with less than 70kW (about 93 bhp) it can, in theory, be restricted. See something wrong in the list? Great, we need to hear from you! Most importantly, we need to know the source of your information, and it has to be verifiable. Good sources would include links to manufacturer web sites with specifications for the model in question, data from trusted trade publications (like Glass’s, Parkers, etc.) or information supplied by importers or distributors. We need to be able to verify the weight and rated power output for each model. Finally, where exactly did you find this information? Include a link if possible.